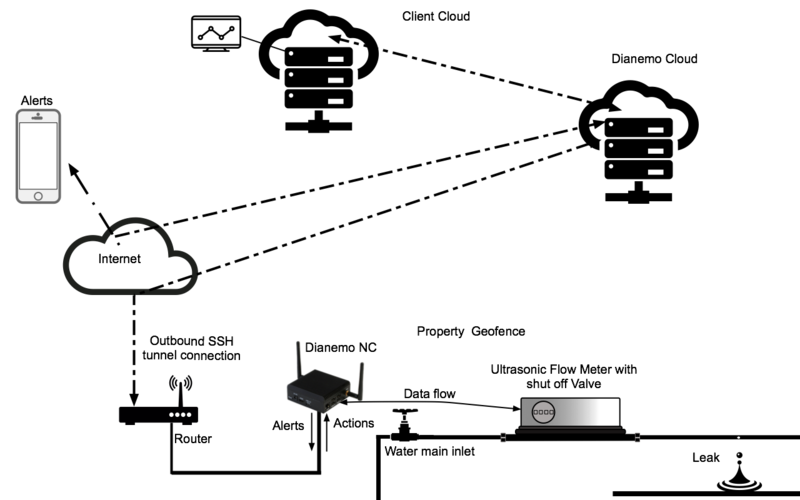 Dianemo lets you take control of the IoT devices around your home. With alerts and automated actions you can relax whilst Dianemo manages your world . Dianemo is Smart IoT Home Control for Everyone! 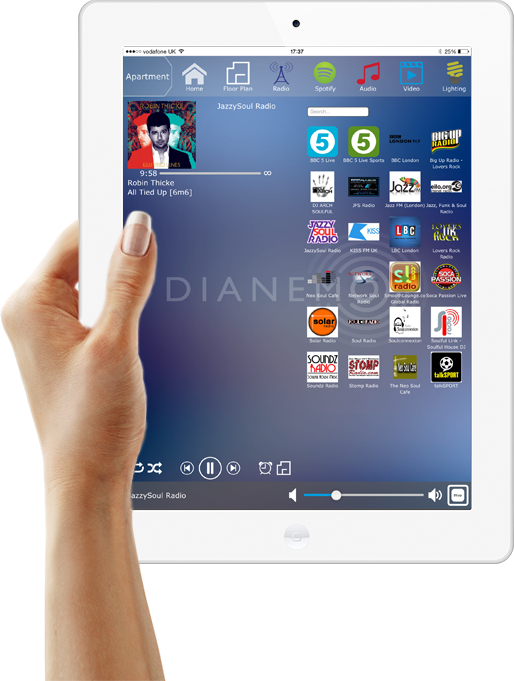 Dianemo is designed to bring together all your digital services and home control requirements in one flexible and easy to use system. It's built around a powerful smart hub to provide the central control and interface to other “Smart Home” and control equipment. With IoT driving the development and adoption of technologies that connect people and their ‘things’ combining all of these disparate technologies and devices into a unified system is an obvious areas for focus. 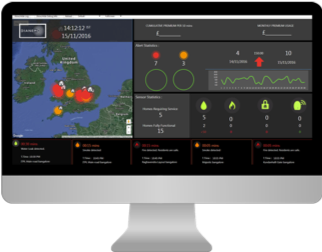 Sensors working in conjunction with devices drive out data that can be analysed and translated into meaningful information that enable control and management – alerting risk events and even enabling direct intervention. In order for this to happen in the smart home sector there needs to be a centralised command centre that can receive and transfer data, and then be able to act on information coming back, either by way of alerts or commands. Dianemo is uniquely placed. Its design is to work holistically across the whole property and to connect and make sense of the different activities that happen – other products cannot do this as they have been developed to be specific – i.e. mange energy or lighting – and this is a significant differentiating IoT feature which makes Dianemo the best choice to control your world. Dianemo has a range of built-in features designed to enable seamless integrated control. 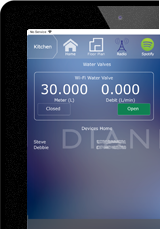 Dianemo can prevent leaks and integrate your homes lighting, smart plugs, heating controls and any third party product with an open control interface. Lights on at Dusk, off at dawn? Dianemo can provide smart control of all major lighting control systems. Easily set the right lighting mood for every occasion. Dianemo supports for all the major heating & HVAC systems. Set your parameters and let Dianemo decide when the heating goes off and the AC comes on. Want to wake up to your favourite radio station or go to sleep to the sounds of your favourite album? With Dianemo a few clicks and your wish is our command. One of the most exciting opportunities for Dianemo within the IoT arena is to work with property insurance companies to benefit their customers through reducing claims situations and potentially reducing premiums. By understanding what is happening within their home, through control and management systems, householders can be alerted to anything untoward and take preventative action – e.g. a water leak turning into a major incident. Insurers can be involved in this process and by analysing claims and usage data will more accurately be able to offer premiums priced to actual risk. We have undertaken in-depth research for the potential of the connected smart home for insurers and believe that it will be a disruptive situation. Real risk indicators, based on actual use patterns, will replace the use of proxy indicators currently deployed in the industry. Dianemo, already established as a leading control and management hub for connected home devices, will be the key component to enable the sourcing of relevant key data from the home and its translation into meaningful information to both householder and insurer. The first release Dianemo InsurTech Solution which we call HomeGuard, has been based on intimate knowledge and experience of that sector, ensuring that the Dianemo HomeGuard Solution has been designed specifically to meet insurer requirements. Above is an illustrative demonstration of how Dianemo HomeGuard can work to resolve a potentially catastrophic water leak. The Dianemo Nerve Centre (NC) is the crucial link that connects hardware and sensors to your technology notifying users & insurers of a potential leak. 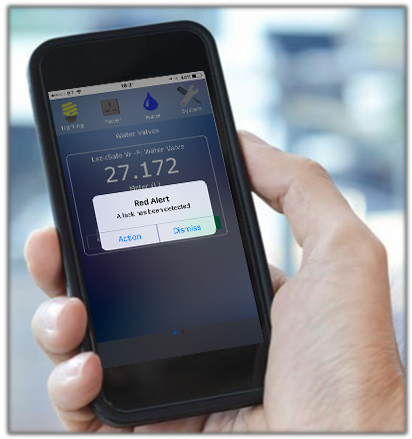 This enables the user to remotely activate leak prevention hardware & constantly gather data. 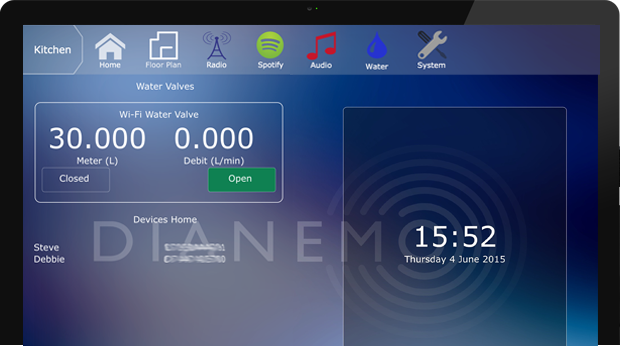 When Dianemo detects unusual water flow, the user receives an instant notification to their devices and if enabled, third party support centres.This provides the user or an authorised support technician the option to close the valve in real time. By pressing ‘Action’ the device sends a message to the Dianemo Nerve Centre which results in immediate closure of the valve in the valve hardware. With built-in pre-defined business rules or AI capabilities closure of the valve can be automated to also provide immediate closure of the valve. Secure remote access by authorised support technicians can also access the system to manually immediate close the valve in the event of no action being taken by the home owner. The Dianemo HomeGuard solution can also monitor and alert/take action on any IoT device (Thermostats, Lights, Smart Plugs/Sockets, Smoke detectors, Humidity sensors and smart electrical appliances etc ) with an open protocol. The Dianemo Nerve Centre monitors data inputs from multiple sensors and applies rules based alerting and automated actions against those rules if necessary. 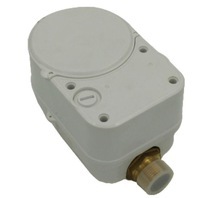 An Ultrasonic Water meter with integrated shut off valve can detect water drips down to 0.003 M3/h providing protection against burst pipes and small leaks. Customer Notifications are sent to immediately to their devices in the event of an incident allowing actions to be taken or alerts to be dismissed. All alerts and device health data can be sent to a remote notification centre for service providers where additional action can be taken via a Secure Remote Access path. All data can be stored and mined for analysis of trends and potentially provide preventive actions. Dianemo is designed and manufactured by Convergent Home Technologies Limited. We are a privately owned company, focussed on high class, affordable home automation technology systems. Our aim is to create an affordable Smart Home solution for everyone. Convergent Home Technologies was formed in 2004 by a team of experienced senior managers and technology experts with over 30 years business and IT experience. Together they have worked with a number of other trusted partners to bring you Dianemo. Our focus is always geared to the needs customer and aim to ensure we are able to bring you a product that meets your every requirement and a level of service you deserve. In parallel with this strategy, our team of established and highly qualified staff in the areas of consulting, project management, IT technology, security and programming continue to develop Dianemo in an ever changing marketplace to ensure you are at the forefront of home technology. Headlines from our latest news items. Click on an article for full details. NTT Data Services demonstrates how the Dianemo IoT Nerve Centre can prevent water leaks and reduce insurance claims. The Dianemo Insuretech IoT hub has now been launched enabling a new era of IoT features for insurers. 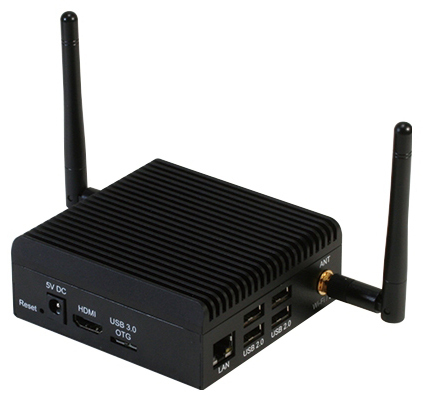 Dianemo to become the IoT Nerve Centre for the connected home. To celebrate the official launch of our new user interface we thought we would take this opportunity to send out a newsletter to our contacts to remind you of all the great features in Dianemo, now available to be accessed easier than ever before.